Anandamela 20 January 2017 Bangla patrika ebook pdf download. 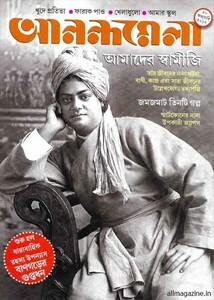 One of the most popular Bangla Magazine for Children and Juvenile, it is 'Anandamela' which is publish from Kolkata by ABP Limited and it is not only popular among all over the Begali language children but also like teenager and youth. This is a fortnightly edition and usually publish on 5th and 20th date of every month. Today I want to share with all of my dear and sweet little blog readers, Anandamela 20th January 2017. The cover stories of this edition's are Our Swamiji and various events in his life, three excellent stories, info about helpful apps, serial mystery novel Bangarer Guptadhan, science, sports etc. You could also collect all old edition of Anandamela from Here.